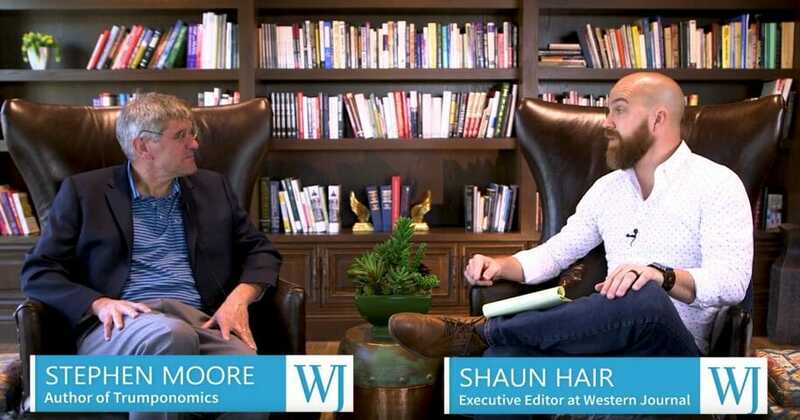 Stephen Moore, an economist and author, sat down with Shaun Hair, executive editor of The Western Journal for an exclusive interview. Moore discussed the policies of President Donald Trump and their impact on the American economy. SH: Tell me a little bit about “Trumponomics.” It came out last year, and Trump, in himself, is a divisive figure, so certainly naming an economic book after him, right off the bat is asking for conflict. Tell me the idea behind “Trumponomics” and why you wanted to write it? SM: Well, it was about three years ago now that I first met Donald Trump in his office up in Manhattan on Fifth Avenue in Trump Tower. I went in and I was really mesmerized by a lot of his ideas. I don’t agree with Donald Trump on everything, but he was really focused on, you know, making sure that all our policies are aimed toward putting America first, as he would say. You know, is this going to be good for American businesses, is it going to be good for American workers, and I totally agree with that. You know, it’s not, is this going to be good for France or Japan, but is this going to be good for us? And I loved that. And I loved his businessman background. Isn’t it awesome that for the first time we actually have someone who knows something about business, and how to run a company and how to meet a payroll and how to cut expenditures? So, I was very attracted to that, and so we — Larry Kudlow — who’s now the chief economist for Donald Trump, and I worked with him, we helped put the tax plan together, uh, we helped him on some of the regulatory and energy issues. I don’t always agree with Donald Trump on some of the issues on trade. I’m more of a free-trade guy than he is, but it’s been a — as my mother used to say, the proof of the pudding is in the eating, and you just look at the results of what Trump has done on the economy in just a little over two years, it’s phenomenal, right? I mean, nobody — this is even surprising me, and I’m an optimist — of what he’s been able to achieve. SH: Tell me a little bit more about that. When you say the results have been phenomenal, what results are you talking about? SM: Well, I’ll give you — one of my favorite statistics that’s easy for people to remember, is we now in America have seven million more jobs than people to fill them. Think about that, that’s like more than, about the same number of people who live in the entire state of Arizona. That’s how many surplus jobs we have in the United States today. And so that’s good. We’re seeing wage gains for workers. I love what The Wall Street Journal reported a few weeks ago that the biggest wage gains have been for the lowest-income workers, so we’re actually helping the people at the bottom the most. Which is, you know, something we’re really proud of. We have the lowest black, Latino, female unemployment rate. We have the lowest unemployment rate ever for people without a high-school degree. Again, we’re helping people at the bottom. And so, all of these policies have put a new spring in the step of the American economy. I would make the case to you that today we have the best job market for workers since The Beatles were still playing together. You know, and I would say that, you know, for the economy in general, it’s probably the best economy in 20 years, and that’s pretty amazing and I think it’s going to continue. SH: What specifics about Donald Trump’s policies have helped the American economy? SM: It’s not any one thing that Donald Trump did. Now look, I helped write the tax plan, I helped the White House push that through the Senate. You know, I think we got it passed by one vote. And so I’m really proud of that, and I think that’s sort of the gemstone of the Trump economic plan, getting tax rates down for businesses, and that has allowed them to hire more workers and pay more wages, and so that’s been a huge asset. But more than — and, you know, this is a president that has reduced 20 regulations for every new regulation he has put in place, so think about that. That’s a great, great record, too. We’re now, because of his energy policies, the number-one producer of oil and gas in the world. We’re actually exporting, not importing, you know, and that’s gigantic. But all of those are secondary to one, the most important thing: Donald Trump is a businessman. He is no-nonsense, he is focused on growth, he’s focused on, you know, what’s good for American workers, and, look, I mean, I’m not here to criticize Barack Obama, but it makes a big difference, and you know, I mean, I think Barack Obama did the best that he could — let’s face it, when you replace a community organizer with someone who really knows how to build business, that makes a big difference. There was just this unleashing of the animal spirits of the economy, when businesses and employers and workers knew that if they made a profit or were successful, the government wasn’t going to come and bash them over the head with a billy club. SH: Do you foresee that kind of trend and optimism continuing? SM: Yeah, I do. I do. Now, look, the danger is, if you listen to what the Democrats are saying these days, I mean, and it’s frightening, actually. SH: The Green New Deal? SM: The Green New Deal, you now have this talk about a trillion dollars of reparation payments for slavery, you’ve got Medicare for All — we can’t even afford the Medicare we already have — massive increases in Social Security benefits, the Green New Deal, which would give people, or, you know, take away our cars and our airplanes. And then there’s another one they’re talking about called guaranteed national income, where basically if you can’t, you know, just give, just write everybody a check. And those things, we estimate, could cost $50 to $100 trillion over the next 25 years. So that’s scary, and when people ask me, “Is this boom is going to continue?” — yeah, as long as we, you know, hopefully re-elect Donald Trump into the White House. But imagine if we get a President Elizabeth Warren, or a President Kamala Harris, or someone like that, that’s frightening to me. I mean, I think it would be so damaging — or Bernie Sanders — I mean, so, it matters a lot that we continue with the policies we have in place. And one of my big problems right now when I listen to liberals — look, Trump wants to grow the economy, make the pie bigger, so everybody has a bigger slice. The Democrats, they don’t want to grow the economy, they want to redistribute the economy, and, if you’re rich we’re gonna take it from you and give it to him. And that’s not the way, I mean, where has that ever worked? Right? Never worked anywhere. And so, I’m very nervous about that, I think a lot of investors are, too. SM: But I’m gonna even make another case. You never help someone by giving them something that they can do for themselves. I mean, it’s just a good life lesson, you learn that with your kids when you bring them up, don’t do something they can do for themselves, you’re not helping them, you know? And this idea, everything is going to be free. We’re going to give you free college, we’re gonna give you free health care, free daycare, free food, free this — that is going to sap people of their economic energy. We need to get people off of these government programs into a job, and by the way, that’s what gives you purpose and a mission in life. Nobody wants to sit around — well, a few — but not many want to just sit around and watch TV all day. You want to get out of bed in the morning and have a purpose, and by the way, work is very highly associated with happiness. And so, yeah, it’s not fair to take, you know, whether it’s Bill Gates or Warren Buffet or whoever it is, they made their money because they served their fellow man by providing services people were willing to buy, but you’re not helping people by giving them stuff. If you care about people, we have charities, we have donations that people can make to help other people, businessmen and businesswomen who, you know, one of the most compassionate things you can do is give somebody a job, right? You know, that’s an amazing service you give to your fellow man. It’s a service to your fellow man to provide people with the services that they want and that they need. And so, this idea that businessmen and women who get rich are somehow evil, I just hate that idea. No, the reason I believe in free market capitalism, I can only get rich under free market capitalism if I give you something that you want, right? And at a price that you want it for, and that’s number one. Number two, I just think the idea of continuing to give people stuff for free never works. Now, we’re a rich country, in the United States, we’re the richest country ever in the history of mankind. Nobody wants to see anyone go homeless, no one wants to see people go without health care, or go hungry. We can provide those services for people who are disabled or incapable of working, but for people who can and should be working, you’re not helping them by giving them stuff and, you know, all of these welfare programs should come with work requirements. Yeah, if you’re homeless, we’re gonna give you housing, if you’re hungry we’re gonna give you food. But you know what, you’re gonna have to work for that. And I think that is fair and compassionate. SH: Yeah, I agree. There are some hiccups that have happened recently in the court system for work requirements in a few states, Arkansas included, which is where I originally am from. Do you foresee the trend continuing of trying to …? SM: Which trend is that? SM: Oh, yeah. You know, when I worked in the mid-1990s, I was part of that, remember, Republican revolution back in 1994, when Newt Gingrich became speaker and Republicans won for the first time in any of our lifetimes, the House of Representatives, you know, there were a lot of exciting things that happened in that period, but one of the most beneficial policy changes we made — which by the way, was a law that was signed into law by Bill Clinton, a Democrat, a genuine New Democrat — and that law basically said, if you are able-bodied and if there’s jobs available, you’re gonna have to, we’re gonna give you the skills and the training so you can work. And what we found some Democrats, some of the liberals, went crazy: “Oh, my God, this is like slavery, it’s gonna be the most horrible thing,” and what we found is, over half of the people that were on welfare were placed in jobs, and many of them actually started climbing the economic ladder. I mean, you can’t get out of poverty being on welfare, right? I mean, the only way to get out of poverty is to get a job and climb up that, rung by rung, that ladder. We were really proud of the fact that’s what a lot of these folks were single mothers, and they were thankful that they had a job and that they had a purpose, and that they were able to make a lot more money than they made when they were on welfare. SH: As you’re looking at the economic trends now and we’re hearing plans like the Green New Deal — I don’t live in the world of economists — are there economists behind the scenes, are there people connected to the political world that think the economics of the Green New Deal are possible, or is this just a joke and a sham? SM: I happen to think that a lot of the climate — climate change is more of a kind of religion now than it is a science — and if you look — now look, let’s say there is climate change and let’s say that the planet is warming. You know, my response is to say we’re going to deal with that the way we always deal with problems. You deal with it through technology and growth and higher incomes and innovation that will allow us to make the changes that are necessary so that our planet doesn’t continue, you know, to heat up. Does anybody really think the government is going to do anything about changing the planetary weather? I mean, really? I mean, these are, we spend hundreds of millions to try and reduce, they can’t even get rid of hunger and starvation in Africa. So, it’s a stretch to think that somehow by diminishing our living standard and giving more power to government that somehow that’s going to change the trajectory of the climate of the planet. The other thing is, there’s a real extensive cost to what they’re talking about. We get 85 percent of our energy, or so, somewhere around there, from fossil fuels and nuclear power, and, you know, that’s because they are cheap and reliable and for the most part, they are actually clean-burning, especially natural gas. We produce more oil and gas than any other country in the world today. We’re gonna stop producing that? Really? That’s the reason, by the way, that Donald Trump won the election. I mean, Hillary Clinton would go to places like West Virginia and Ohio and say, “I’m gonna kill every coal job,” and then she wonders why she lost the state. You know, people don’t like it too much when you tell them you’re going to take away their jobs. And so, I think the solution to this is to continue to grow and continue to innovate and not deprive people of electric power. Everything we have, this show would not be possible, the shirt you’re wearing, the computer you’re tapping on, the cell phone I have — everything is derivative of energy. When you start screwing up energy policy, you can truly dismantle an economy in a way that could be severely damaging. SH: Speaking of the economy, we spoke before the interview about the national debt. Some have called it a crisis, others put it in different words, but it certainly would be something that, I think, regardless of your political ideals, it should be a concern. Unless you’re one of these people that thinks we can just print more money and fix all of our problems — I know you are not that — how would you characterize the nature of our debt and what is the solution, or is there a “who” to the solution? SM: It’s amazing, when I first came to Washington in the early 1980s, around 1983, our federal budget was about $1 trillion and our national debt was about $2 trillion. Today, we have a budget that’s closing in on four-and-a-half trillion, and our national debt is now 22-and-a-half trillion dollars, so think about that. Now, look, that’s happened under Republican presidents, Democratic presidents, Republican congresses, Democratic congresses — I’ve concluded none of these politicians want to do anything about this, they just want to play Santa Claus and keep, you know, charging up the credit card. Now, think about this, we now have a debt of $22 trillion — by the way, there’s 12 zeroes in a trillion, so that’s a huge number — now on top of that, Democrats want a $50 to $100 trillion Green New Deal with no way to pay for it? I mean, we would bankrupt our country, everyone knows that. Now, there’s a new theory by the left that says, it’s called modern monetary theory. I’m not making this up. They believe that as long as interest rates stay low, they just borrow and borrow and borrow and borrow and spend and spend and spend. That’s like saying, until I reach the limit on my credit card, I can just keep ringing it up and ringing it up and ringing it up. Look at countries that have tried to do that. Countries like Venezuela, countries like Greece, countries like Uruguay and others. What happens — Zimbabwe — their currency becomes worthless and their living standards decline. We don’t want to follow that model — so, yeah, we got to get serious about the debt. I would call for a 5-10 percent across the board cut in everything. Every agency in America, in Washington, can cut their budget by 5-10 percent, probably more than that. I would start looking at eliminating corporate welfare, I would have these work-for-welfare requirements. The best way to bring down the deficit is to get people working and paying taxes, not collecting government benefits. All of these things would have a profoundly positive effect on our debt and deficit. And by the way, you know, I call this fiscal child abuse, because the people who are gonna pay this bill are the young people. SH: I want to ask you one last question: If you get to add one more chapter to “Trumponomics” over the next year, what do you think that chapter would be? SM: Well, we have to get Donald Trump re-elected, because the left would repeal almost all of the positive things he has done for our economy, so that’s number one. Number two, I think the next big thing is tackling some of these big entitlement programs that we were talking about. Whether it’s making sure Social Security is financed. I like the idea of letting young people invest the money in their own, like 401(k) plans, instead of having the government take everything out of their paycheck. I like the idea of building up infrastructure in this country, and not necessarily with government money. We need pipelines, we need LNG terminals, we need refineries, we need better ports, we need better airports. There’s no reason all of that has to be paid for by government. Why can’t the private sector build up our infrastructure? This is something Donald Trump wants to do, Democrats have blocked that from happening. So, those are a couple of areas. And then finally, and you started with this, right, I was one of the architects of the 9-9-9 plan — let’s do it. Let’s get tax rates down to 9 percent payroll tax, 9 percent income tax, 9 percent sales tax, great idea. Can you imagine the rocket fuel that would be for the economy, if we could do something like that? So, we’ve got to get Herman Cain elected the next president of the United States, so we can get this done, and it would be so amazing for our economy. My buddy and I, Art Laffer, helped write it down with my friend, Rich Lowry, who lives in Ohio, and it would be the next big thing for the American economy. SH: You were part of the team that put together the tax cut package that Trump pushed. Do you agree, or how do you assess some of the criticisms, that it was just a tax cut for the rich? SM: Well, first of all, the biggest tax benefit in percentage terms went actually to middle-income people. We think that the numbers are about $2,000 in cuts for middle-class families. That’s for people who make between, say, $40,000 and $100,000 a year. Now look, Nancy Pelosi may think that that’s “crumbs,” but that isn’t crumbs to somebody who is making $50,000 and you get to keep an extra $2,000, plus the wage gains that people have made, you know, people are earning about $3,000 or $4,000 more. And so, we have seen really nice gains, and that’s why I’m so proud of the wage gains. You know, the wage gains have been the biggest for the lowest-income people. And it’s not a tax cut for rich people. For one thing, we’re growing the economy, so in 2018, first year of the tax cut, there was more revenues collected by the federal government than any other year in history. It’s a spending problem, it’s not a revenue problem. SH: You said that lady told you she didn’t really like Donald Trump, and we know that he is certainly a divisive character. You mentioned earlier that you’ve had the occasion to meet him and have personal interaction with him. Tell us a little more about what that’s like, to interact with Donald Trump. SM: Well, first of all, I mean, he is a freak of nature. I mean, I’ve never met anyone who has the energy and optimism that he has. I mean, it’s just incredible. I’m 58, he’s, what, in his early 70s, and he was running circles around me. It’s jut amazing, his energy level, and he’s always thinking about, what am I going to do next for the American people, to make things better, to make people better off in this country. Now look, 95 percent of politicians would pander and say, “Of course, I always pray and say my prayers,” but Donald Trump, it was so interesting, he literally, 30 to 45 seconds, he thought about it, you know, he was thinking about it, and he said, “You know, I just can’t seem to think of anything I need to ask the Lord for forgiveness for,” and it was so funny and it was a hilarious moment. So, he does have a sense of humor and he’s a really good person. I love being around him, I don’t always agree with him, but he is larger than life. I love his optimism. Every time I see him he is upbeat, He reminds me of Ronald Reagan in that way, Reagan was also upbeat. And people always ask me how are Reagan and Trump alike — and by the way, I believe Ronald Reagan belongs on Mount Rushmore, I think he’s one of our greatest presidents. Donald Trump isn’t there yet, but if he continues like this he might be. But I always say one of the most interesting similarities between the two of them — by the way, they are both big men, which is not the one I meant — but the big similarity is that they were both always underestimated by their political opponents. That was true of Reagan, and that is true of Trump, you know, and to the peril of their opponents, because they’ve used that to their advantage. So, Trump is really a wonderful man in a lot of ways, and he’s always been so good to me. Whenever I say something on TV he doesn’t like, you know, he’ll call me, he’ll chew me out, but he’s an amazing man. And so I told that story to then-candidate Donald Trump, and I said, you know, you’re gonna be in Orlando, it might be nice to meet John Michael. And he said, “Oh, I absolutely want to,” and we had arranged for when Trump was — because at that point, these events were pandemonium, it was like a Rolling Stones concert — but I’ll never forget, he got off the plane and walked down the stairs, and they had John Michael there in his wheelchair, right there, and Trump spent at least five minutes, five to 10 minutes, talking to him and wishing him the best, and got a big ovation from the crowd. You know, he’s a good man, a really good man. SH: That’s good to hear. I really appreciate your time. SM: Thank you. Great to be with you, thank you.